Last year I read the book The China Study and was forever changed. It really had me thinking about the types of foods we eat, and in fact after reading it I started to incorporate three plant based days per week into our weekly menu roundup. This summer, after doing more reading and after thinking about how much better I feel by just adding those three plant based days, we made the decision to go ninety percent vegetarian. My husband and I both have no problem giving up meat and poultry, but we both really love seafood so we will be more “pescatarian”, or vegetarians who enjoy the occasional seafood meal. I am not sure if this will be a forever change, but at this point we are both enjoying our new vegetarian lifestyle and I doubt we will go back to meat. Looking through the many vegetarian recipes online and in my cookbooks I keep seeing dishes that are often called rice bowls or indulgence bowls that contain a number of ingredients, often seasonal, that are artfully arranged in a bowl and served as a vegetarian main course. Many of the options I saw contain brown rice, some type of bean, and a selection of seasonal vegetables. I decided to create my own bowl, one that I call our power bowl because it really is packed full of everything you could want nutritionally in a meal, and tastes great too. 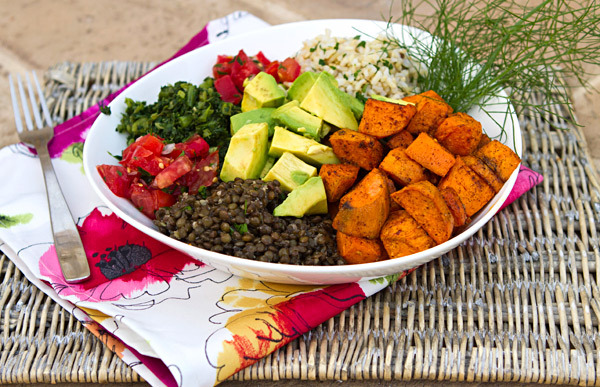 The trick to assembling your power bowl is to season each of the ingredients well when they are prepared so the bowl has a lot of flavor. Some folks may drizzle their bowls with a dressing, but I wanted each of my ingredients to stand on their own. 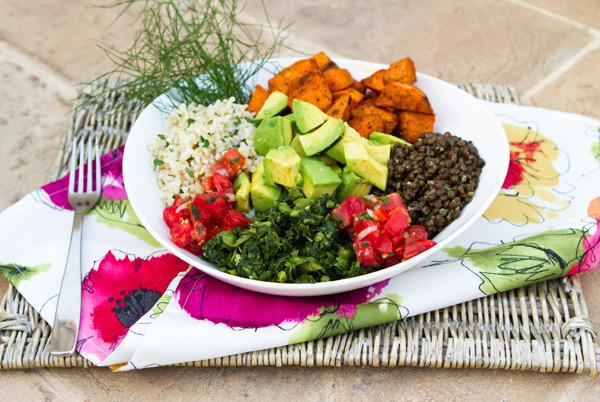 In my power bowl, I included brown rice flavored with lime juice and cilantro, roasted sweet potatoes flavored with spices, black Beluga lentils tossed with cumin, sautéed greens, fresh avocado, and diced tomatoes. I am sure you can come up with your own personal power bowl, just be sure to include a combination of brown rice and beans for protein, and a couple of seasonal vegetables that you prefer. I used chicory as my sauteed green, but spinach, kale or Swiss chard are also great options. Brown rice brown rice as an excellent source of manganese, fiber, and a good source of the minerals selenium and magnesium. Lentils and beans are high in fiber and a good source of low fat protein. Spinach can claim a special place among vegetables in terms of its phytonutrient content. Most of the flavonoid and carotenoid nutrients found in spinach that provide anti-inflammatory benefits provide antioxidant benefits as well. Spinach is also an excellent source of other antioxidant nutrients including vitamin C, vitamin E, beta-carotene, and manganese, as well as a very good source of the antioxidant zinc and a good source of the antioxidant selenium. Sweet potatoes are true superstars. They’re loaded with carotenoids, vitamin C, potassium, and fiber. In a bowl, toss the sweet potato chunks with the olive oil, chile powder, paprika, salt and pepper. Lay the potatoes on a baking sheet, and cook for 20 to 25 minutes or until fork tender and lightly brown. Cool the potatoes to room temperature. 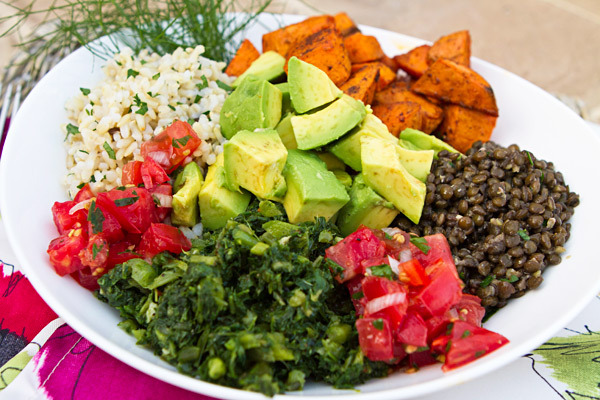 Arrange the sweet potatoes, beans or lentils, brown rice, greens, avocado, and tomatoes attractively into two bowls.